I met someone the other night, we shook hands, and said hello, and then I realized we were already Facebook friends. We had never met face-to-face before, or even spoken, yet she gets to see my vacation photos or hear about it when I have a hard day. At the time, I may have approved her request because we had friends in common and I wanted to be polite, but I allowed her right into my world. We now live in a society where sharing every tidbit about yourself to the world at large is a regular occurrence and many don’t think about the consequences. Here’s a look at what and how we share and overshare on the Internet. This spoof from The Onion pokes fun at the banal pics that we feel compelled to share. Taking hundreds of photographs and uploading them to social media sites is simple, so it’s all too easy to share too much (writes the girl who just posted 300 photos from a recent vacation). A hilarious reminder that nobody wants to see your drunken party pics, except maybe the cops. 2. Who is the ME in social media? A great look at who we are in the new social sphere by one of the most knowledgeable writers on the subject. Brian Solis weighs in on who is sharing, why, and what impact this is having on our identities. He backs up his story with nerdy-fun stats. (Yep, 57 per cent of us have later regretted sharing something online.) Love the line about “digital extroverts and information socialites.” Is social media’s success due to the fact that it grants each and every one of us access to fame? I’d have to agree. We’re ultimately responsible for the information about us that propagates in the social world, but many of us may not realize the longer-lasting effects of what we share online. 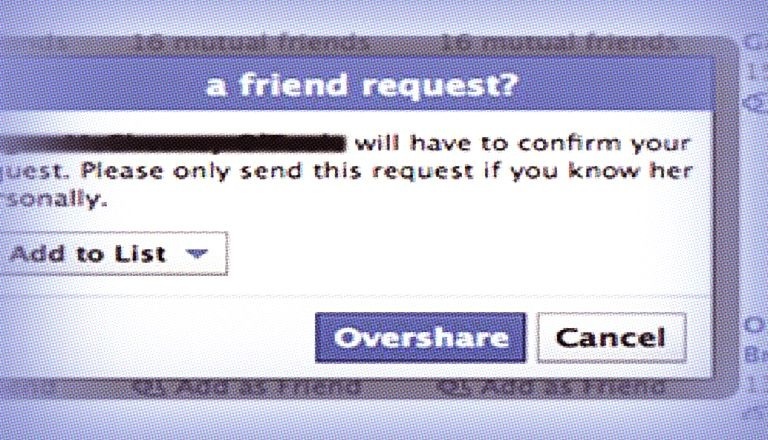 What happens when someone else decides to share your online life for you? Digital culture has forever changed the concept of privacy, and once something is shared you can’t undo it. This article is an insightful look at privacy and the most public government security breach to date. This list may come off as overly cautious, but even if you don’t do any of these things to protect your security, at least think about them and consciously choose one way or the other. In the end, we can control what and how we share, so be mindful of security settings and think before you tweet. A new trend in social sites taps into your creative side by letting you create visual inspiration boards. I used to clip images I liked out of magazines and store them in plastic page holders. As my time became scarce, folders on my computer desktop took over, but it wasn’t a satisfying system for reviewing the images later. Websites such as Pinterest, Ffffound and Polyvore make storing, organizing and sharing your favourite inspirations from the web easy. They allow you to interact with like-minded people, without revealing personal information (other than the fact that you like kittens and mid-century modern furniture).